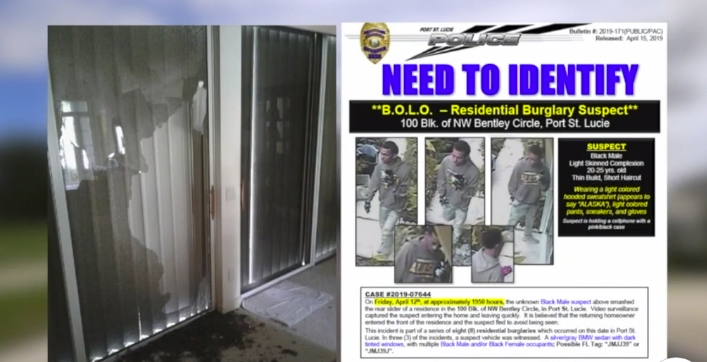 Police seek the public's help in identifying a man they believe could be responsible for several break-ins along the Treasure Coast. PORT ST. LUCIE, Fla. — Port St. Lucie police are looking for leads after a series of home burglaries. The Port St. Lucie Police Department said eight homes were hit on Friday, April 12. Surveillance images captured one of the suspected crooks. 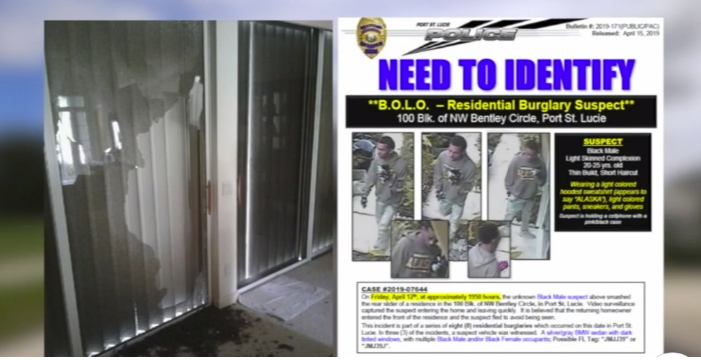 Police said a thief wearing a hooded sweatshirt that appeared to read 'ALASKA' smashed the rear slider of a home in the 100 block of NW Bently Circle around 7:50 p.m.
Investigators said the homeowner returned home during the crime and the crook ran away to avoid being seen. If you have any information about the crimes, call Detective Joshua Saffomilla at 772-871-5247, or Treasure Coast Crime Stoppers at 1-800-273-TIPS. WPTV's Sabirah Rayford is working this story, and will provide updates throughout the day online and on air.